Travel in style! Our most manly grooming ritual deserves masculine and aesthetic accessories, also when on the move. The leather case is made up and finished by a regional manufacturer. The untreated natural cowhide leather is tanned using a special vegetable method. Its particular appeal? The natural material is long-lasting and durable and develops an individual patina in the course of its use: the traces of the owner, his travels and experiences. This model is delivered with a exclusive travel shaving brush with Silvertip Fibre®© brushhead (ringsize 21 mm) and a 3-blade Gillette® Mach3® razor with chromed metal-parts. The leather for this case is tanned in Germany and painstakingly processed into a high-quality product in order to retain its natural characteristics. Slight variations in the colouring and small scars are features of the natural material. We recommend applying a thin layer of care cream or grease for untreated leathers and gently polishing the case with a soft cloth. The case fastener on the outside becomes more supple with time. Slide the fastening button through the hole by pressing the edge of the hole with two fingers. The bristle load used is Silvertip Fibre®, which dries very quickly and is highly durable. 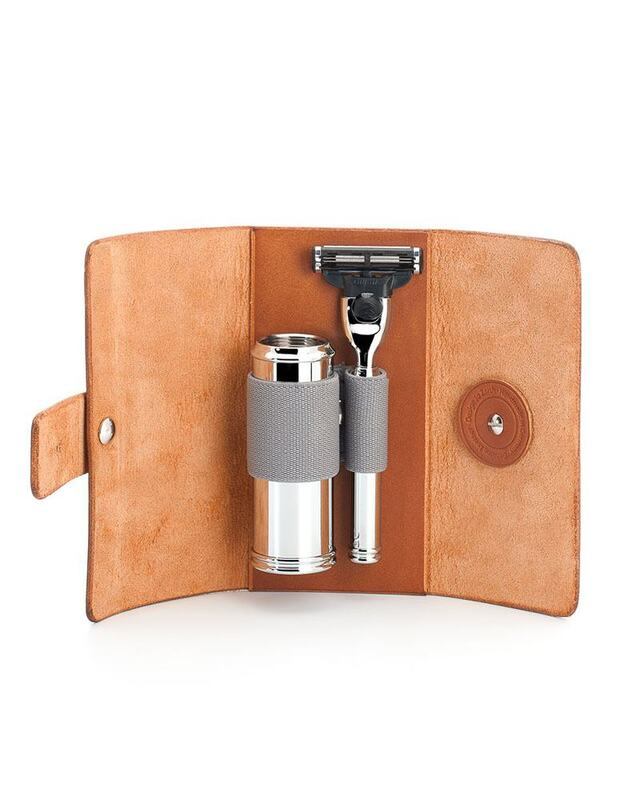 To accommodate a complete travel kit including brush and razor in style and safety we offer fine leather cases handcrafted in Florentine style, finished in black or brown.